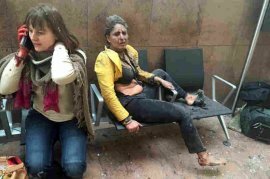 Two women sit in the airport in Brussels after the Tuesday morning explosions. The blasts hit near the departure gates, collapsing ceiling panels and shattering glass windows; Belgian media said 11 people were killed. 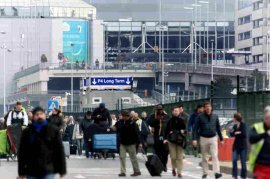 People are evacuated from the Zaventem international airport after a terrorist attack early Tuesday in Brussels. 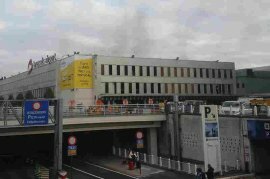 In this image provided by Daniela Schwarzer, smoke is seen at the Brussels airport after explosions were heard Tuesday. More than 30 people are dead and more than 200 wounded after two blasts hit the airport and another struck a metro station in the Belgian capital. People stand near the Brussels airport after being evacuated following the explosions. 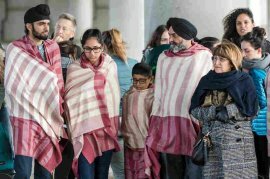 People stand outside the Brussels airport after the explosions. The airport was evacuated and closed, with flights canceled or diverted, and Belgium issued a Level 4 alert denoting "serious and imminent attack." In this photo provided by Evan Lamos, passengers clamber from a metro carriage after the explosions in Brussels. 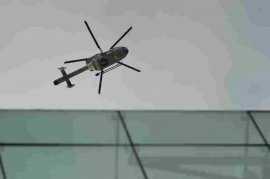 A police helicopter flies in the area of the Maelbeek metro station after Tuesday's attack. Trains were halted, and the city went into lockdown. A victim is evacuated on a stretcher by emergency services after an explosion in a metro station in Brussels. 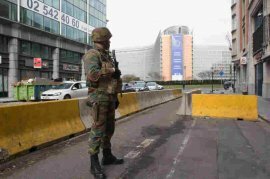 A Belgian soldier stands guard near the headquarters of the European Commission. 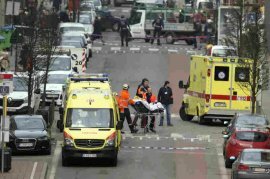 There was an explosion at the nearby Maelbeek subway station during the morning rush hour on Tuesday. More than 30 people are dead and more than 200 wounded after explosions struck Brussels during the Tuesday morning rush hour, Belgian officials say. Two blasts hit the international airport; another struck a metro station. Belgium issued a Level 4 alert, denoting "serious and imminent attack." 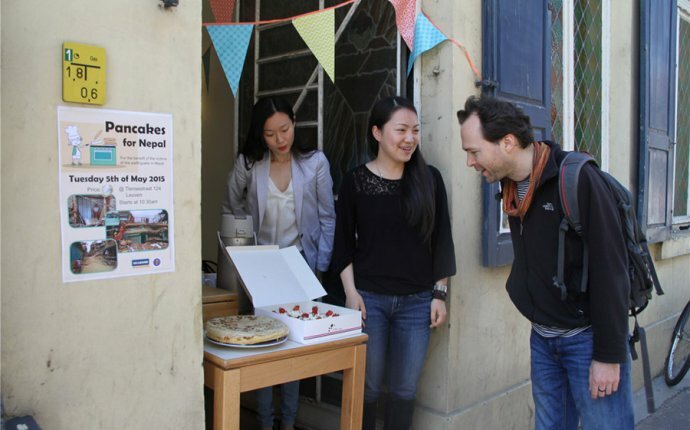 "What we feared has happened — we were hit by blind attacks, " Prime Minister Charles Michel said at a midday news conference Tuesday. At a later news conference, Michel said Belgium will defend its liberty and values, and he stressed the importance of returning to normal life in Brussels as fast as possible. Investigators in Belgium are asking the public's help in identifying the man on the far right, who was seen at the Brussels airport before this morning's terrorist attack. This image, provided by the Belgian Federal Police in Brussels, shows three men suspected of taking part in the attack. Wearing a jacket and hat, the man is seen in an image taken by a surveillance camera at the airport. Authorities say they are actively seeking him. The image is similar to a wider photograph of the same man alongside two other men, all three of them pushing luggage carts. Officials say that the other two men, both in black, may have acted as suicide bombers; Belgian media outlets have noted that each of them wears a single glove which, those outlets say, might hide a trigger for a bomb. As of 4 p.m. local time, the Belgian Crisis Center reported that at least 10 people had died and 100 were wounded in the attack at the Zaventem airport, and that 20 people died at the Maelbeek metro station, where some 130 were wounded. ISIS has claimed responsibility for the attacks, in a statement released via the Amaq News Agency, a group that's been linked to the militant extremists. The statement blames Belgium for participating in the fight against ISIS and says that "several" fighters detonated explosive belts at the airport and train station. According to media reports, Belgian federal prosecutors say a house search later in the day, in the Brussels neighborhood of Schaerbeek, "led to the discovery of an explosive device containing among other things nails." Investigators reportedly also found chemical products and an Islamic State flag. NPR's counterterrorism correspondent Dina Temple-Raston says that investigators have discovered additional detonators, ISIS flags and other such materials over the past week in raids across Belgium. French President Francois Hollande said "terrorists struck Brussels, but it was Europe that was targeted — and all the world that is concerned." A suicide attacker struck around 8 a.m. local time, according to a federal prosecutor. The explosions hit near the departure gates, collapsing ceiling panels and shattering glass windows. The blasts sent smoke billowing from the airport and set off a panic as people ran from the airport with whatever they could carry. A video from nearby in the terminal that's been aired on Belgian broadcaster VRT shows travelers cowering as dust and smoke fill the air and sirens blare. We'll warn you: The video contains a profanity and may be stressful to watch. The facility was evacuated and closed, with emergency crews looking after the wounded and security personnel gathering any evidence that might provide details about those responsible. 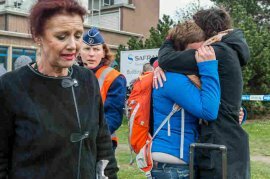 The attack began after a burst of gunfire and yelling in Arabic, according to Belgian media outlets. Around 9 a.m. local time, an explosion struck a metro train in or near the Maelbeek station, causing chaos close to the European Union headquarters in the city's center. The station is about 7 miles from the airport. Images of the aftermath of that attack show people running for safety along the tracks through a darkened and smoke-filled tunnel, after trains were halted. To clarify information that went out in an NPR news alert earlier this morning: There have been at least three explosions — two at the airport and one at a train station. An early report suggested there were three explosions on the subway.